The NANOSENSORS™ SSS-MFMR AFM probe is optimized for high resolution magnetic force imaging. 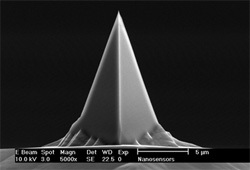 The SuperSharpSilicon™ tip basis combined with a very thin hard magnetic coating result in an extremely small radius of the coated tip and a high aspect ratio at the last few hundred nanometers of the tip - the essential demands for high lateral resolution down to 20 nm in ambient conditions. Due to the low magnetic moment of the tip the sensitivity to magnetic forces is significantly decreased if compared to standard MFM probes but the disturbance of soft magnetic samples is also reduced. The hard magnetic coating on the tip is characterized by a coercivity of app. 125 Oe and a remanence magnetization of app. 80 emu/cm3 (these values were determined on a flat surface). Please watch the new product screencast on NANOSENSORS™ Magnetic Force Microscopy MFM Silicon Probes at http://youtu.be/qssFxoZ8ELY.